I love stews. They’re so thick and filling, and I make sure mine is chock full of good healthy starches and veggies. 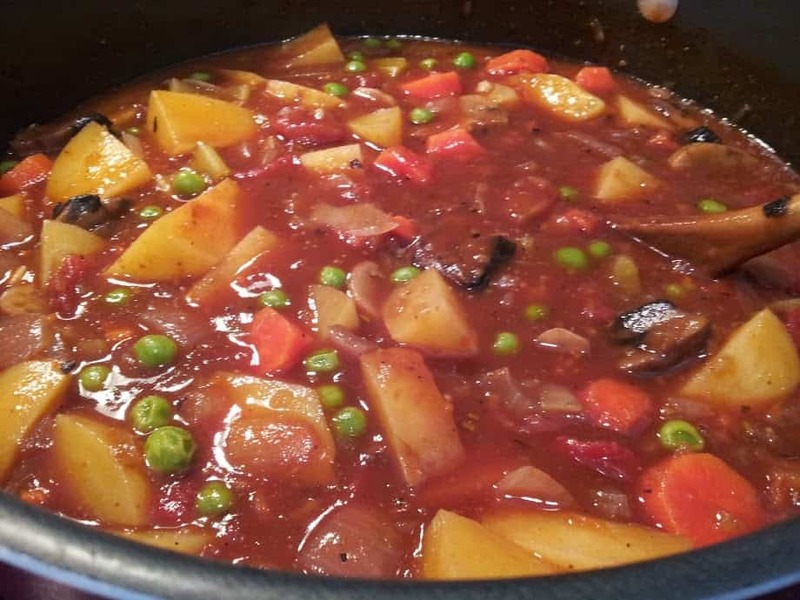 Like this recipe for my Hearty Vegetable Stew. I normally make a big pot of Chili to take for my work lunches, but yesterday I pulled this one out of the recipe folder, and boy am I glad I did! I forgot how GOOD this was! It’s also very low-fat and perfectly Vegan (of course). 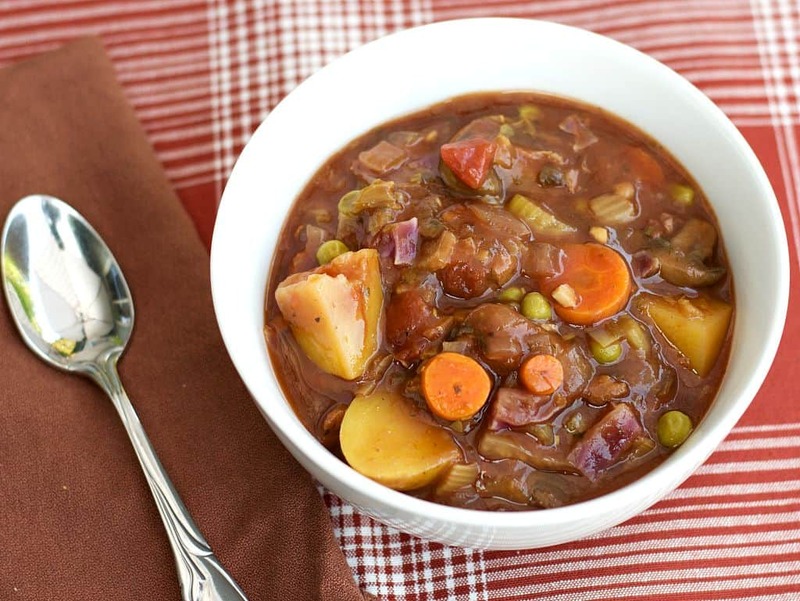 In fact, as my kids would say, this Hearty Vegetable Stew is the BOMB! Pair it up with a nice, warm hunk of homemade bread, and you’ll be thanking me later I promise you. It may look like a lot of work, but honestly, it’s worth it. I have made this several ways over the years, and since I just made this last night I thought I’d update the recipe, include a few new photos, and re-post it. Many people have asked about leaving out the wine in my recipes, I think it adds a really rich flavor but if you cannot have wine, additional veggie broth or water will work as well. Lastly, many of my non-US readers have asked about Kitchen Bouquet. It is simply a browning sauce, mostly used for coloring. I like the rich color it gives my food, with the bit of additional sweetness, but it is completely optional if you cannot find it or choose to leave it out. I know Amazon has it, and I’ll include a link here. But I also found this on the web for possible substitutions…. Depending on what flavour would go with what you are making, you could try Worcestershire Sauce (vegan), soy sauce, instant coffee granules or Bisto gravy mix, though the latter will also thicken the item a bit. 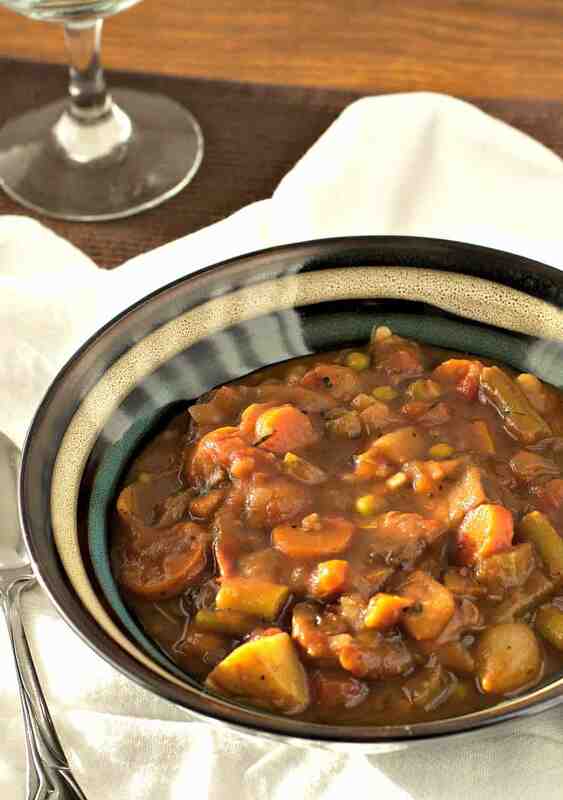 A Hearty Vegetable Stew chock full of healthy starches, veggies, mushrooms, and a rich savory broth. Paired with a thick slice of homemade bread - perfect. Saute this mixture in 1/4 cup of veggie broth until the veggies are nice and soft. Should the pot boil with the lid on or off? Your choice really. Just remember with the lid off, more moisture will evaporate basically thickening the stew. If you like the consistency as it is, leave the lid on! Hope that helps and enjoy! My stomach is growling!!! So going to make this tonight! Just bought some Bouquet yesterday after your gravy post…yum, yum, yum… I’ve used Bouquet before but was out. It’s a great little helper in the kitchen!!! I always have a bottle! Looks fabulous. Can’t wait to make it. How about serving with some of your yummy biscuits too? Making tomorrow. Cold and windy. Sounds wonderful. Have all ingredients except wine so I’ll add some extra broth. Thanks for the recipe. Loved this! I doubled the recipe and served it for 20 people, served with garlic bread. I added 1/4 tsp red pepper flakes to spice it up a bit, and I didn’t have cornstarch. No leftovers! I’m going to serve with these yummy rolls that are freeze and bake – and apparently have no butter (so no dairy). They were stupendous last time. I got them at a fairly standard mid-western grocery chain in the freezer case. What is the nutritional info? I am calorie counting. As made, it would be < 200 calories per bowl. I added chick peas, black beans and corn instead of peas, also jicama, butternut and chayote squash and it still came out at less than 200 calories. if you took a jugful out and used a stick blender to puree it, then added it back, you could thicken it without the cornflour. Awwww. Glad you like them! I live in a Vegan household – my significant other is Vegan. The vegan world is a tough one because you have to watch everything that’s doesn’t come from the earth and then some. Also things will say vegetarian that aren’t vegan. And honestly I’ve fumbled quite a few times. I’ve made some awful Vegan recipes – not yours of course. This one is just delicious. The smells right now coming from my kitchen are stupendous. You’re a gifted chef. Awww Thank You SO much Sandee! Delicious! I didn’t have white wine, so I used red. I added some allspice and a whole clove and I made a roux because I didn’t have cornstarch. Great recipe! My first attempt at making vegan stew was a success! Thanks! I guess the recipe must have been changed because no white wine was noted. Red wine was. Or perhaps you subbed white for red. Not a huge deal but the comment was a bit confusing. I wonder whether the roux makes a better thickener or not. I’m inclined to make a roux because I think if you use some of the juice – even a bit – with water it tends to blend better.I might add the allspice and whole clove that does sound good. Just made this today. Very good. I hate when people say I made it exactly as listed BUT. LOL! However, I did make this as instructed, except I only had one small Yukon gold, but I had a Jewel sweet potato – a white flesh sweet potato, so added it as well, with some quick cooking bulgur as I didn’t have seitan. This is so good. I think next time I will chop the carrots smaller, they are still a little firm and everything else is cooked through. Great flavor, no one would ever miss having beef with this. It tastes a little sweet though I didn’t add any sweetner – think it’s the sweet potato? I ate this w/o carrots and mushrooms and it was really good! For our last leftovers we added a little brown rice which made it perfect. I don’t see when to add the Kitchen Bounty in the instructions… had everything for this in the kitchen except that and made a special trip to the store. Am I missing it? Wouldn’t be the first time :). I believe it will be in step 10 when it says to add the rest of the seasonings. It mostly adds color (deepens it). Just made this awesome stew. The only thing I did different was that I added Kirkland no salt seasoning which added a great kick. My meat eating husband loved it and had 2 bowls already. Thanks so much for sharing this recipe Chuck. I’m enjoying so many of your recipes. I wanted to check in with you. I know mom is emailing us and I talked with her yesterday but I want to be of help to her and your dad. I’m not sure if I need to go to Houston now or wait. What are your plans? Mom sometimes doesn’t communicate everything if you know what I mean? This recipe was awesome. The only thing I did was add Kirkland no salt seasoning and it added a nice kick. My meat eating husband liked it and had 2 bowls already. Thanks for sharing this recipe along with all your other great recipes. Made this stew last night and it was so so good! Great new recipe to add to my list of vegetarian/vegan comfort foods. Will definitely make again. How can I make this in my new Instant Pot?? Thanks! I already have a recipe…. My potatoes still aren’t cooked. I don’t get it. Boiling for a short time and simmering for a long time does not cook potatoes completely. What am I missing here? I would parboil them a bit myself. Made this. LOVED IT! No swaps, tweaks or additions necessary. Will definitely make this again. Love your recipes. Love what you do. Thank you! Twenty minutes prep, likewise cook? No way. It took me 3+ hours to get this dish to an edible state. Pissed off everyone in the house. What pot or pan did you make this in??? It neeeded to cook far longer than I thought so I’m glad I started early! I used a couple bay leaves instead of rosemary because my family doesn’t care for it, but this was thumbs up from everyone including the teen boy! This will be a keeper for fall & winter comfort food. Served it with rustic sourdough bread and a spinach salad with apples, red onion, dried cranberries and pecans. With all the prep and cooking time it took me 2 hours and 30 minutes. I didn’t change a thing. I made it without kitchen Bouquet. Instead i added a tablespoon of both dried rosemary and italian seasoning for more flavour. And one large red onion for chopping. I used white and chestnut mushrooms. Within the last step of the recipe, i prepared dumplins made from vegetable suet before hand. So i added the dumplins after the cornstarch, put a lid on my pan and on the lowest heat simmered for 25 minutes, i then needed to add more corn starch for a thicker consistancy so i added another tablespoon and returned to cook for a further 15 with the lid on. Served with basmati rice weirdly enough, was a fiance’s request. Was lovely. Will make again. This lasted us three days of dinners! So worth the cook and i enjoyed making this dish! In my recipe book!! But bare in mind it isnt a 40 minute meal to make unless you are a pro! Yes, how does it go freezing and for how long? How long does it keep in the fridge al so? I have no experience with wine whatsoever. Any particular red wine that I should use? simple red cooking wine is fine. if you want a fuller taste, use a bordeaux, a pinot noir for a lighter tasted. If you have a favorite wine, use that. Cheers! we loved this recipe. i didn’t have any red wine on hand so didn’t add it. there isn’t too much left for tomorrow because we couldn’t stop eating it. My husband and I transitioned to a vegan diet 6 weeks ago and so I am constantly looking for new recipes to keep things interesting. I really like it that you use foods that are readily available because we live in Baja California and some things can be hard to find. And I like it that you worked at making recipes that mimic lots of the favorites from our carnivore days. I made this vegetable stew today with a few tweaks to suit our tastes and we thought it was great alongside a crusty baguette! The red wine is important for a more distinct taste. I read some comments re time prep and I found that it took me less than an hour. It is important to cut your vegetable sizes according to “firmness” because some cook a lot faster than others. I usually hold back on my potatoes for a few minutes and add the peas once everything is done so avoid mushiness. Hubby prefers his veggies tender crisp so I’m careful on the timing. Just finished making this stew, it smells really good. It took me 45 minutes to complete, this is including looking everywhere for the kitchen bouquet and the mise en place. As most stews are better the next day, we’ll have this only tomorrow…can’t wait! For Aussies – a half teaspoon of Vegemite does very nicely in place of browning sauce. It adds a richness and depth of flavour without being overpowering. I frequently use it in stews – and a few gravy recipes, too. Made a pot stivetop. Skipped the small dicing portion. Didn’t use the bouquet. Didn’t have rosemary. Used bay leaf, marjoram, in addition to the rest of ingredients. S more if a soup consistency. But, Wowza. Better than any restaurant. Thank you! Could this be made in a crockpot? Any changes needed to do that? I made this today in preparation for a big storm coming tomorrow! It was super delicious the first day so I know it will be even better tomorrow. I added some ciabatta bread and vegan butter on the side. Thank you for creating a greta vegan stew! I made this today, but substituted red kidney beans for mushrooms, and added some turmeric and fresh cilantro. Delicious! Thanks! I’m on my second helping now. This is amazing!!!! Thank you!!! Is it possible to make this in a crock pot? I usually don’t post nutritional info because all the calculators are so different with different numbers. I just made this. It’s so delicious. It’s going to be my go to stew recipe. You are genius, thank you! Made this today and it was delicious! I didn’t have Kitchen Bouquet, and skipped the cornstarch thickener, but it was still rich and brown, just lovely. So glad to have found this site. Thank you, Chuck! This was amazing!!! I only made 2 changes. I used Herbs de Provance because I didn’t have Italian seasoning and I added a couple chopped up Morning Star faux sausages, because I have 2 growing, teenage sons. Finding comfort foods that my sole meat eater in the family will eat has been difficult, but this one passed the test. ANOTHER fine recipe! Very flavorful. I follow the recipe exact other than I like to add a little extra potato to make it a bit more hearty, and I also dont cook all of the mushroom juice away. Doing so tends to darken the stew color and add a bit more room flavor. After a few days I mix it up a bit and serve over rice. Thanks Chuck. Fantastic recipe. I made this for my omnivore parents and they loved it! Omg. So delicious! Love this recipe. Will definitely do again. I did add herbs de Provence and red pepper flakes for seasoning. This is a winner! Love it! I blasted the veggies needing to be minced in a food processor with the grate attachment to save time. Then I subbed the mushrooms with beef style TV P pieces. (whole packet because YOLO) and used beef style stock instead of veg stock. Potatoes and carrots are cooked perfectly.. Amazing! Just for this recipe I brought some bottles Kitcen Bouquet from my US west coust trip. I am living in Europe. Hi Chuck. Have you ever tried making this in the Instant Pot? If so, how much time?? I made this almost exactly as written, didn’t use any mushrooms whatsoever, no kitchen bouquet, and. I balsamic. For the love of god, make and use this broth. This broth made the stew arguably the best stew or soup I’ve ever made. I used the red wine (a must). Even with a more buttery, nutty Parmesan broth used instead of regular vegetable with the tomato based stew, it works amazingly. I’m shocked at how good it is. I also added a whole lemon’s worth of juice to the stew, used dry herbs because that’s all I had, and added a bit extra red wine to the minced veggies while they were sautéing. Best ever! So happy with this stew I’ll never make a different vegetable stew now. I am sure the broth tastes great, but it is not a vegan option. Step 2. How do you sauté vegetables in broth? Doesn’t sauté mean lightly fry in some sort of oil or fat? I guess that is the standard Webster’s Definition. Only we don’t use oil. We use water or broth. My husband and I just bought an Instant Pot today and searching for recipes, I discovered your site! This was our first attempt and wow, is this delicious! Thank you for a wonderful recipe. This is a keeper. I happened to have 1/2 of can of tomato paste in the fridge to be used up so I used this instead of the tomato sauce. I added 1T of the spices. Other than that, I used your recipe for the ingredients. We cut the potatoes pretty large like 3/4 to 1″ so I used the slow cook version on MORE for about 2.5 hours and it needed more. I’m going to try it at 4 hours next time. Otherwise, it looks like I just need 15 minutes on the MANUAL setting for the pressure cooker option. New to vegan would be helpful if you would add prep time in cook time 2 recipes. Made this twice and I’m really not a vegetable stew/soup eater, but I love this one! Finally a good stew! I’m actually making it right now for company in town! Thanks for the great recipe! Hard potatoes and carrots (it was cooked for at least 2 hrs). I figured out it’s from cooking in acid. I found this disappointing. The flavours were nice though. Sorry you had a problem, hundreds of others absolutely love it. I made it again today. We love this recipe. I must learn how to use my food processor. The only complaint of this recipe is the time it takes to cut the vegetables. Thank for sharing. What about cooking in a crockpot? sure – it would work fine. Would this be suitable for the Mary’s mini if I leave out. Any oil and the wine? I think the idea of a MM is for it to be boring….if I was doing another MMN I know I could easily overeat this. Just made thissrew tonight. It’s wonderful! Going in the dinner rotation. May even go in a lunchbox cold. I made the vegetable stew last night and it was delicious. Thank you, Chuck, for always coming through with delicious recipes. So yummy! I added Worcestershire and used frozen corn instead of peas. 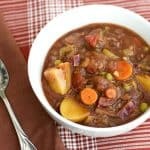 Hi there, I was wondering if you have ever tried or if anyone’s tried using vegan beef broth instead of veggie broth for a more stew flavour?! I’m sure veggie would be fine but I only have the veggie based beef broth on hand right now and I’ve been dying to make this recipe!!! I have honestly never heard of vegan beef broth…. If anything I’d check the sodium, because I know other broth’s can be loaded with it. Made this last night. Delicious. This is a keeper, and I’ve tried more than a few vegan stew recipes. Thanks! I made this a couple of days ago for dinner. I followed it almost exactly, just left out celery because it’s one of the few veggies I hate!! I also used passata instead of canned tomatoes as that was all I had. It turned out great. I would recommend par-boiling the potatoes and carrots if you wish to decrease the cooking time (I was hungry and impatient! ), but otherwise it was easy to prepare and most of the ingredients I already had on hand 🙂 There are conveniently lots of leftovers to keep me going for the rest of week. Thanks for a tasty and healthy recipe. I will definitely make it again. Absolutely delicious recipe! I made a batch for 5 dinner guests and was so pleased with the results. It looks just like the picture. I did not use rosemary, kitchen bouquet or frozen peas. The wine (to me) is essential for a great taste. I added diced butternut squash with the potatoes and threw in some kale toward the end. To get a thicker stew, I added three Tablespoons of cornstarch and water. I served the stew with a side of steamed string beans and a green salad with olive oil and rice vinegar dressing, which paired nicely with the thick stew. You can’t go wrong with this recipe. It probably won’t freeze well because of the potatoes. On the other hand, it will last a few days in the fridge. Try it! Please let me know exactly how long to cook once you add the vegetables. Looks delicious and would like to make. Thank you. Hello! I just finished putting this all in the crock pot after sauteing the veggies a bit to help them cook down. I realized that I added a 14 oz can of tomato sauce and the stew smells quite tomatoey. Does anyone have a recommendation on how to tone that flavor down a bit? Oh my gosh. I’ve made this a couple times now and it is amazing. It is by far one of my favorite stews! The only thing I’m missing is kitchen bouquet, but that’s because I’m having a really hard time finding it. Parisian sauce is a browning sauce in Australia and available in supermarkets.